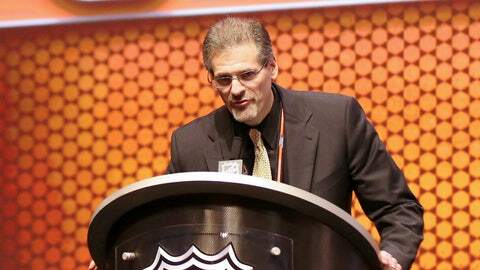 Philadelphia Flyers general manager Ron Hextall wasn't a fan of the NHL's ruling on Zac Rinaldo's hit. Philadelphia Flyers general manager Ron Hextall voiced his displeasure with the league's decision against suspending Zac Rinaldo for the Boston Bruins left wing's hit on center Sean Couturier. Rinaldo avoided further punishment after a review from the NHL's Department of Player Safety deemed the hit worthy of a penalty but not worthy of a suspension, the league announced Thursday. Rinaldo was assessed a five-minute major and a game misconduct for the hit in Wednesday night's game. Couturier was shaken up on the play and did not return to the contest. The league explained its ruling in the following video and said Rinaldo's hit Wednesday was more of a body check than a clear, targeted head-shot. The league also said it did not consider Rinaldo's previous history in its decision not to suspend Rinaldo, as it said a player's past history only affects a decision after the league deems a play worthy of supplemental discipline. Rinaldo has been suspended three times in five seasons for illegal hits. Hexy acknowledges that league has tough job on determining suspensions. "That's a job I would not want."